My Son & I have a Financial Services business that requires a very close banking relationship with a local bank. 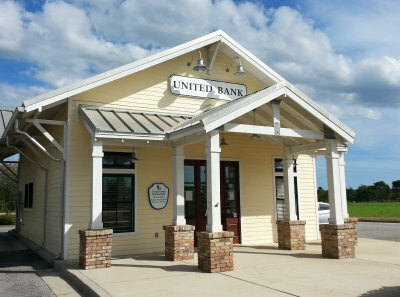 For the last few years we have enjoyed a terrific working relationship with United Bank, a 100+ year old community bank headquartered in Atmore, Alabama. After a lifetime of dealing with national chain banks, it is amazing the level of service we receive from this small local bank. The main branch that we use is in Summerdale, Alabama. My bank representative for the last few years has been a nice lady named Brenda. The branch building, pictured above, has 2 transom windows facing west so the afternoon sun would shine right in the faces of the Tellers. When discussing stained glass one day, Brenda jokingly suggested that I ought to build some transoms for those windows ..... to moderate the effect of the sun. She made a good point, and since I love the architecture of this building, I filed away the suggestion for future consideration. I have a lot of projects I keep "on the back burner", many never come to fruition. Over the next six months, I watched my friend Brenda fight a heroic battle with cancer. When she finally lost that battle, I decided these transoms should be built. United Bank transoms were completed in August, 2016. 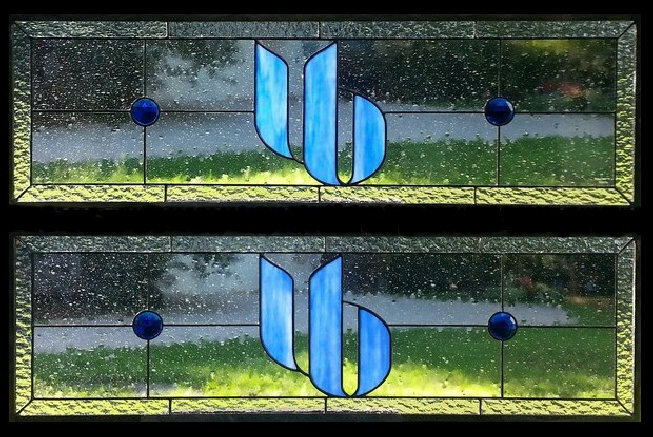 Each measures 9.5 " x 30.5" and contains 25 pieces of glass. 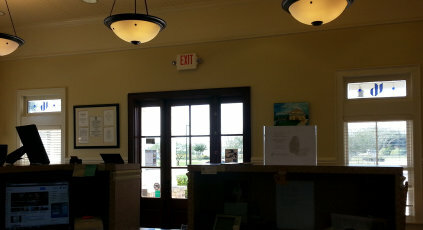 They are now installed in the Summerdale, Alabama branch of United Bank. These transoms are dedicated to the memory of our friend Brenda.